Julie is always looking for events going on in or around the places we are staying so while in Lisbon she found out about a Medieval fair held in the historic village of Obidos. The advertising promised Jousting, Jesters and costumed vendors selling Medieval fare, and visitors could even hire costumes for the day, all in all it sounded like the perfect family day out. If you went to a Medieval fair would you go in costume? We travelled into Lisbon by train and then used the Metro to get to Campo Grande getting there far earlier than required (as planned, buses to Obidos were 2 hours apart so we didn’t want to chance losing two hours of our day by missing the bus by a few minutes) we had lunch in a cafe to pass the time. The bus ride was an hour long and dropped us right by the entrance to the village. As we’d just sold our house in NZ and we’d read about all the night time events we had decided to get a hotel in the town, many website reviews recommended the evening as the majority of the tourists leave and you get to hang out and party with the locals. We stayed in the Hotel Rainha Santa Isabel, great location in the heart of the village, the rooms are dated but roomy and feel more or less at home in their medieval setting. 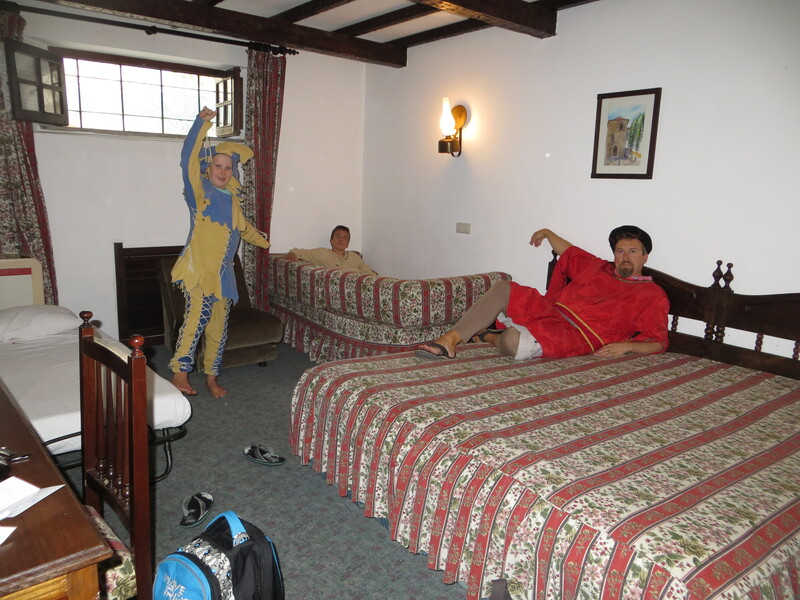 We only had a couple of day packs so we hit the costume hire straight away, Lucas dressed as a Jester, Jacob as a peasant, Julie as a Moorish woman and I as a nobleman, I fully recommend the costume hire, entry to the town was 6 Euros, but if you hired a costume the entry was included , so costume hire and entry was 7 Euros, 1 Euro for a well made costume is going to be tough to beat! Notes: You need to leave an ID as security for the costume, drivers licence is fine. Also you do get a discount if you show up in your own medieval costume, I believe it was only 4 Euro’s for costumed visitors. The pricing in the fair is actually very reasonable, for a full on period re-enactment taking over the whole castle and keep and to a lesser extent the surrounding walled village you’d expect to pay a lot more than 7 Euro’s in fact in other places you’d likely pay many times as much and still pay at least as much just for costume hire (if they even had it). Food too was very reasonably priced barbecued fare, we ate in a restaurant set up to support the local volunteer fire brigade, our dinner and drinks came to 20 euro’s all up. So how was the fair? The walled village of Obidos is a living picture postcard, white washed houses with the odd vibrant splash of colour from Bougainvillaea or similar flowers, cobbled streets of course and in these few weeks of July almost everyone dressed in Medieval costumes, tourists were taking photo’s of other tourists as much as the town and locals. The views from the beautiful castle and it’s rustic walls atop the rocky hill are expansive, a few modern buildings in the far distance do detract from the period re-enactment but overall the view is spectacular. As with any costume party a few people let the side down, when it only costs 1 Euro more to join in the fun you have to either be very anti or completely ignorant of that option. In the village very few of the tourists appear to have hired costumes, but perhaps they weren’t going into the castle grounds, as, when in the castle with all the locals and vendors in costume, there seemed to only be about 10% of people not in period costume. The Jousting was great, the knights were excellent horsemen and displayed their skills they also entertained the crowd further by surprising our group by charging their horse at us, apparently in anger at our cheering their opposition. The Jesters were great, entertaining regardless of language barriers, especially the full length evening performance, which I even became part of for a while. 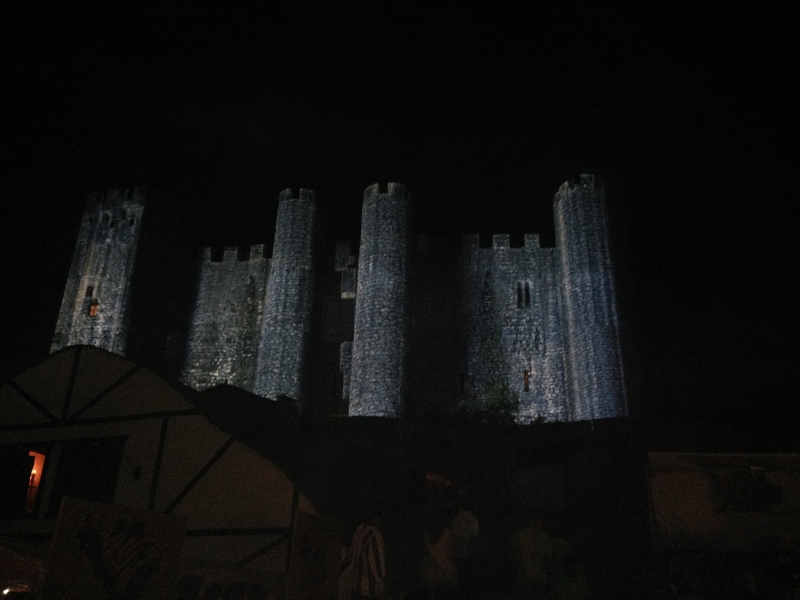 This year the night time entertainment included a video mapping display on the castle walls which was excellent, though I read some critics saying it didn’t fit with the period re-enactment and that it seemed to be added at the cost of the amount of street performers of former events. Hopefully the feedback will encourage the organisers to bring back the full contingent for future years, we had no basis for comparison and couldn’t fault the event. Our boys loved this event. Luke wanted to be a real jester, one group of lunchers in full medieval garb asked him to entertain them and he was away loving the applause afterwards. Jacob refused to wear sunglasses as he had to be in character, he also bought a wooden knife and scabbard spending the rest of the weekend practicing flipping it, if you’ve looked through many of our photo’s you’ll have noticed Jacob’s permanent teenager’s half smile or even a stern/aloof ‘trying to look cool’ expression, contrast those to the obvious enjoyment his face shows in these pictures! If you like knights and castles, history, feasting on barbecued meats (including chicken, fish, quail, pork and rabbit) drinking beer and wine, while immersed in actual medieval surroundings, then Obidos’s medieval fair is not to be missed, if you’re lucky enough to be in Lisbon or nearby in July I’d mark it down as a must do. If outside that time still go, the town and castle is sure to charm you. Julie outdid herself, she routinely picks great day trips for us, all around this one was probably our best yet. Especially considering that she herself was quite under the weather at the time.